РџСЂРё Р·Р°РєСЂС‹С‚РёРё РЅРµСЃРєРѕР»СЊРєРёС… РІРєР»Р°РґРѕРє: Р’РєР»Р°РґРєР° - РџСЂР°РІР°СЏ РєРЅРѕРїРєР° - Р—Р°РєСЂС‹С‚СЊ РґСЂСѓРіРёРµ РІРєР»Р°РґРєРё, - РїРѕСЃС‚РѕСЏРЅРЅРѕ РІС‹СЃРєР°РєРёРІР°РµС‚ РїСЂРµРґСѓРїСЂРµР¶РґРµРЅРёРµ, РєРѕС‚РѕСЂРѕРµ СЃРѕ РІСЂРµРјРµРЅРµРј РѕС‡РµРЅСЊ Р±РµСЃРёС‚. РћРЅРѕ РїРѕСЏРІРёР»РѕСЃСЊ РІ РїСЂРµРґСѓС‰РµР№ РІРµСЂСЃРёРё Firefox Рё СЃРѕС…СЂР°РЅСЏРµС‚СЃСЏ РґРѕ СЃРёС… РїРѕСЂ. Р­С‚Рѕ РїСЂРё С‚РѕРј, С‡С‚Рѕ РІ РќР°СЃС‚СЂРѕР№РєР°С… СЌС‚Рѕ РїСЂРµРґСѓРїСЂРµР¶РґРµРЅРёРµ РѕС‚РєР»СЋС‡РµРЅРѕ! РљР°Рє Р±С‹ РѕС‚ СЌС‚РѕРіРѕ РёР·Р±Р°РІРёС‚СЊСЃСЏ? One of the subfolders in Sea Monkey mail seems to have become corrupted. Every time I click on it, Sea Monkey crashes. This has only started happening today and I&apos;ve changed nothing in my system. 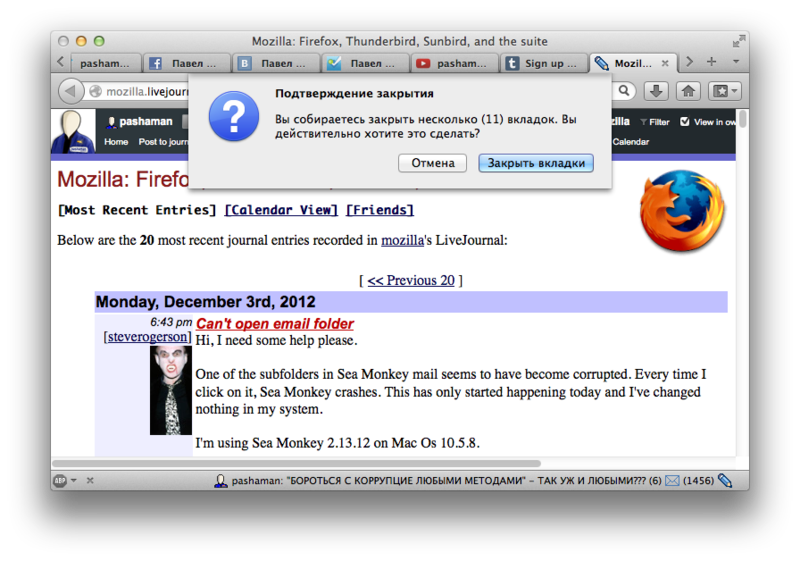 I&apos;m using Sea Monkey 2.13.12 on Mac Os 10.5.8. I&apos;m using Vista. I just want to combine two email profiles onto one thunderbird. About a week ago, I started getting a hella lot of unresponsive script alerts. They kept coming almost every few seconds so, in annoyance, I turned off the feature that alerts me. Now, however, any activity in a browser stops and is (Not Responding) just as often and the experience lasts for just under 30 seconds every time. I looked online and the only вЂњfixвЂќ was to trick the computer into giving the scripts more time to run before it freezes my PC and gives me another (Not Responding). Which does not actually address the issue of why I keep getting scripts that seem to be unresponsive. Now, I don&apos;t quite know the root cause of the issue. It could be Facebook-related, browser-related, or something wrong with my computer. At about the time that the troubles started, Facebook made some changes to its apps, particularly relating to Adobe Flash programs, and that may be the cause of the matter. I also learned that I am not the only one having this problem as many of my Facebook friends are experiencing similar problems and on other browsers. This leads me to believe that it is either something connected to Facebook or that whatever program I use to run scripts is responsible. Therefore, it seems that my best course of action would be to reinstall whatever program I am using to run my scripts. Yet, I thought I would check with you guys to see if you know anything about this that could help. This problem started up about a week ago, and up until that time, everything worked alright. I use Windows Vista and Firefox is my preferred browser, although I have noticed problems when working with IE and Chrome. I have also tried to reinstall Adobe Flash with no improvement. So, should I reinstall whatever program that I am using to run scripts and if so, how should I go about doing that? Or do you suggest something else? I&apos;m running FF 3.6.13 on Vista, and memory is leaking like a sieve. As a test, I disabled EVERY add-on, plug-in, and extension. I went to google.com and just sat there. I tried to join an online conference using Sea Monkey (the latest version) and something in it crashed Sea Monkey. I am using a Mac with Mac Os 10.5.8. Every time I try to restart Sea Monkey it goes straight to the page that crashed it and thus crashes again before I can do anything. I&apos;ve tried restarting but it has no affect. Edit: I&apos;ve now realised that it must be something else that is crashing it as when I try to start Firefox it also crashes. Any ideas? Does anybody know of someplace I could find such a list??? Problem with latest version of thunderbird? I just upgraded to the latest version of thunderbird, and it is no longer able to connect to my email. I can get my mail through yahoo, so that&apos;s not the problem.